The greater sage grouse (Forest Service photo). For the most part, Colorado conservation groups and politicians this week were singing the praises of a five-year collaborative effort to preserve greater sage grouse habitat and avoid federal listing of the bird as endangered under the Endangered Species Act. The “not-warranted” decision by the U.S. Fish and Wildlife Service (USFWS) was announced Tuesday by U.S. Interior Secretary Sally Jewell at the Rocky Mountain Arsenal National Wildlife Refuge northeast of Denver. 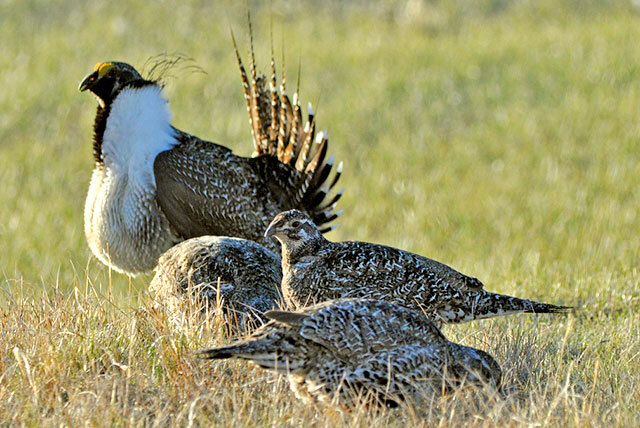 “Secretary Jewell and her agencies have recognized the results of significant conservation efforts that have dramatically improved sage grouse habitat in Colorado and across 11 western states,” said Colorado Gov. John Hickenlooper, who attended the event. The unprecedented collaboration between private landowners, extractive industries, policymakers and environmentalists kicked off in 2010 when the USFWS first determined the bird – whose numbers had declined as much as 90 percent in recent decades – needed protection under the ESA. Both the U.S. Bureau of Land Management (BLM) – which manages more than 8 million acres of federal land in Colorado – and the USFWS assembled teams of experts to make a slew of conservation recommendations to preserve habitat and increase population numbers of grouse — a key indicator species for the overall health of western wildlife habitat. “[Tuesday’s decision] highlights that through collaboration, diverse interests can achieve unbelievable results — focusing on a shared goal and not our perceived differences,” Conservation Colorado Executive Director Pete Maysmith said in a prepared statement. Many of the stakeholders feared that ESA listing of the grouse would result in draconian federal regulations limiting cattle grazing, development and industrial uses such as mining and oil and gas drilling on federal public lands. Some states indicated they would pull out of the collaborative conservation effort if the grouse was listed as endangered. But other environmental groups have indicated Tuesday’s announcement could lead to legal challenges because they say the conservation measures are flawed, filled with loopholes and fall far short of what federal experts had recommended. “The sage grouse planning effort began with great ideas and sound science, but what came out the other end of the sausage grinder is a weak collection of compromises that will not and cannot conserve the species,” said Erik Molvar wildlife biologist with WildEarth Guardians. Invasive cheatgrass, which is prone to wildfire, has moved in to supplant large swaths of sagebrush, which the grouse relies on for nesting and hiding from predators. And some studies indicate climate change may be to blame for the cheatgrass invasion. WildEarth Guardians, based in New Mexico but with offices in Denver, has successfully challenged federal decisions that do not take the impacts of climate change into consideration. The group sued to block the expansion of the Colowyo coal mine in Northwest Colorado for that very reason, although the federal government was allowed to amend its findings. Western Slope state Sen. Kerry Donovan, a Democrat, praised Jewell’s efforts and the years of collaboration between the states and the federal government. Members of Colorado’s congressional delegation had mixed reactions to the announcement. “Even though the Department chose not to place the sage grouse on the endangered species list, this bird will still have an adverse impact on the production of American energy,” U.S. Rep. Doug Lamborn, a Colorado Springs Republican, said Thursday in a prepared statement. U.S. Rep. Jared Polis, a Boulder Democrat whose congressional district extends into the foothills and onto the Western Slope, has spearheaded the sage grouse conservation effort in Congress, guest-chairing a House Natural Resources Committee hearing on the subject, and co-sponsoring amendments to keep the effort going. “The fact that this announcement was made in Colorado speaks volumes about the ability of our state to bridge the partisan divide and overcome Washington dysfunction for the best interests of all involved — ranchers, grazers, landowners, and conservationists alike,” Polis said in a prepared statement. Last week the state requested recognition by the USFWS and BLM of the Colorado Habitat Exchange – a new program that at least initially will focus only on sage grouse habitat. The exchange will try to get ranchers to do conservation work on their land by offering financial incentives to create and maintain sage grouse habitat. They will earn conservation credits that can be sold to industry when their activities such as road building or drilling impact habitat. “The Colorado Habitat Exchange will create a new market for voluntary conservation that will help protect the greater sage-grouse and sustain Colorado’s energy and agriculture economies,” Hickenlooper said. More information on the new Colorado Habitat Exchange can be found online at www.habitatexchanges.org/exchanges/colorado-habitat-exchange.